As weekends go, the weekend of 6th and 7th of April is about as busy as it can get (especially if you include the first Summer League Race on the 9th – that’s 3 in 4 days!). “I did it! !” I want to show other people living with MS like me, that if you put your mind to it, you can achieve. Well after 5 months of feeling like I have been married to the Manchester Marathon, I finally did it on Sunday 7th April 2019. It all started last April when for some reason I thought I would try and run a marathon before I turn 40!! Not sure why I wanted to do this… For years I have always said “Why would people want to run for that long” and then there I was, last April filling in my details into the boxes, only to then get a response straight away to say I was in! Five months of stepping up the mileage, running 5 days a week, swimming 2 – 3 times a week, going to 2 fitness classes a week, basically being tired all the time, all to try and run 26.2 miles on one day. The day itself was amazing. The weather was perfect, no wind, no rain, a slight chill in the air, a little bit of sunshine. The people of Manchester were amazing. There was support all the way round the course, children holding jelly babies out, everyone shouting your name as encouragement, bands playing on the way round. The marshals were also excellent all that time stood around waiting for us just to spray water all over them when collecting your drinks at the stations. I was very nervous at the start as I didn’t know anyone. And then I saw some bright orange vests, Smalley were running. I made a beeline towards one of my friends and, to cut a long story short, we ran together chatting all the way to 20 miles. At this point I left her as I popped into one of the toilets. Unfortunately after stopping just a short time I then found it really difficult to get going again, so low and behold the last 6 miles were tough, bits of walking and moaning and almost crying, but I did it. 4 hours and 6 minutes. I am super proud of myself and you never know I may do it again…. 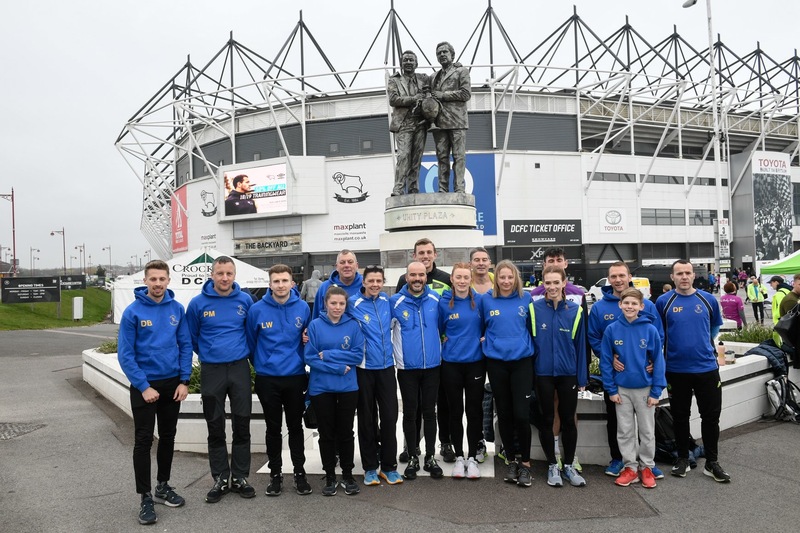 Running both the National Road Relays and the Derby 10K were Joe Rainsford, Dan Bladon, Pete Edwards, Paul Mercer, Dani Smith, Kelsey Moloney, Paige Roadley and Jo Potter. Last Sunday in Manchester was my 6thmarathon. Although I’d done 5 before I wasn’t sure what to expect with this one. Preparation hadn’t started well due to illness after the new year so I didn’t begin training until late January. February and March went well so my expectation was to match my pb of 3hr46 or shave a few minutes off it. On Sunday morning conditions were perfect for running, calm and cool. On the start line I decided to change my race plan for two reasons. Firstly a pep talk from Scott Wigman about race tactics and secondly the position of the pacers in my starting pen. I thought what have I got to lose. I started off with the 3hr29 pacer who set off slightly quicker then I’m used to running a marathon but I went along with it and felt ok. The only problem I had during the early phase was the large group of runners with the pacer was causing congestion problems so I decided to run just in front of this group and it was quieter. 45 minutes in I’d noticed a gap between me and the pacer so the new plan was to keep him behind me for as long as possible (18-20 miles+) and grind out the last 6 miles. The hardest part came after the 20 mile mark. I could tell my pace was starting to slow and the new goal was sub 3hr30. The last few miles dragged but a quicker last mile gave me a time of 3hr26 which was a 20 minute pb. The support from the Heanor RC troop was excellent as always and definitely kept me going. Sometimes they showed up where I wasn’t expecting! Overall I would recommend this marathon to anyone especially for a first one or someone looking for a pb. It is well organised, friendly and the marshals were excellent. The added bonus was having the weekend looking around a great city. Something seems to be working as, at the age of 51, I managed to run my leg only 20 seconds outside my best. If you get the chance to run in the relays at Sutton (6 and 4 stage in September – Club Championship event!) then do it! 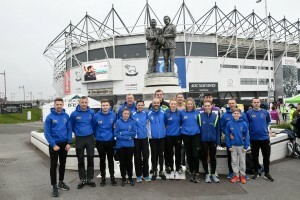 I then had to get up and go again the next morning at the Derby 10K. In almost ideal conditions for running I joined the 4000 runners on the start line not sure what I’d got left in the legs. From aching so much it was a struggle to get my socks on I managed to somehow managed to run my fastest 10K in 10 years (40:58). There might just be something in this consistent running/not getting injured training I’m doing!